I – This Friends&Farms grocery program is really forcing us to eat vegetarian dishes more often. This week was no different. 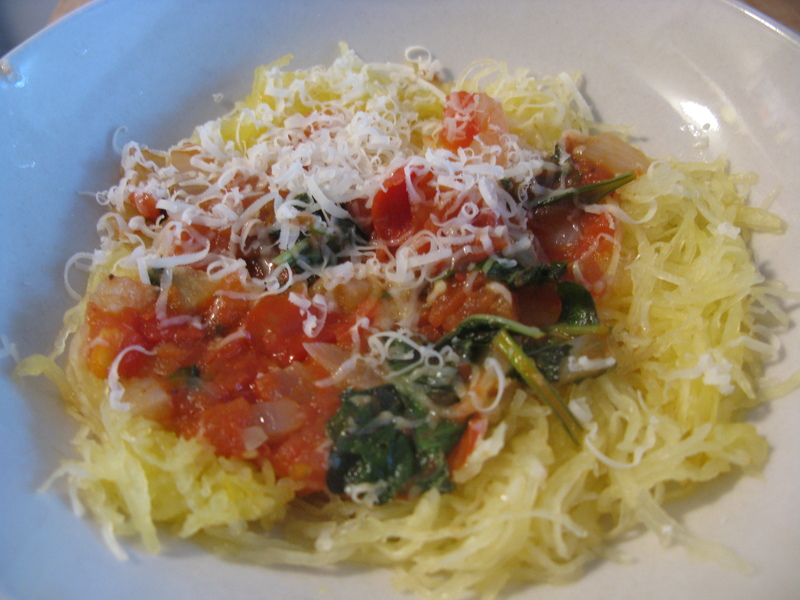 Yet another previously unknown (to me) vegetable landed on our kitchen counter this week – spaghetti squash. I must say that now that I’ve cooked with it, I’m a fan (I don’t think Jeff agrees, but I may be wrong…). And it couldn’t be easier to cook. Literally, just stab it a few times, put it in the oven at 400ºF (200ºC) for 40 min and it’s done! You’ll have to let it cool, then open it in half and remove the seeds. Then comes the cool part – with a fork, start separating the inside of the squash from it’s skin. It comes out looking like spaghetti strands! We ate it with a garlic, basil and tomato sauce topped with shredded Parmesan cheese. This entry was posted in vegetarian by Ines. Bookmark the permalink.